VietNamNet Bridge – Viet Nam risks a loss of 7.2 million tonnes of rice yield and 3.2 per cent of its agricultural land by the late 21st century as a result of climate change, according to a Ministry of Agriculture and Rural Development forecast. Part of a protected forest in the southernmost province of Ca Mau risks being swept away as a result of drought, salt water intrusion and sea level rise. The forecast was delivered yesterday in Ha Noi at a conference on responsive activities to climate change in the agricultural sector in the context of implementing the Paris Climate Accord. Do Xuan Lan, head of the ministry’s Department of Science, Technology and Environment, said the country’s food security and sustainable agricultural development are already seriously affected by the negative impact of climate change. In the past 15 years, flooding has increased along with complicated erosion of river banks, estuaries and coastal areas. Natural disasters have contributed to destruction of the environment, living conditions, and socio-economic activities, he said. Reports from the ministry’s Water Resource Directorate show that natural disasters in recent years have resulted in the deaths of 300 people and caused losses of roughly US$900 million annually, accounting for 1.5 per cent of the country’s GDP. Natural disaster prevention measures have shown good results in reducing loss of life and property. The average number of dead or missing, which reached an annual average of 478 people between 2006 and 2011, has decreased to 226 between 2012 and 2015. Most of the recent tropical storms have not led to deaths at sea. However, climate change has been extreme and unpredictable. 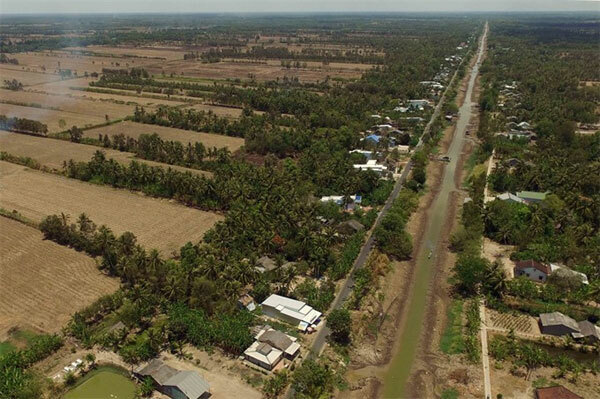 Deputy Minister of Agriculture and Rural Development, Hoang Van Thang, said unsustainable socio-economic development activities, such as deforestation and illegal sand mining, have contributed to the negative effects of natural disasters. In recent years, extreme natural disasters such as super storms, typhoons in the East Sea, droughts, prolonged salinity intrusion, torrential floods and riverside landslides have affected lives and agricultural production, especially in coastal and mountainous areas. Therefore, Thang said, agricultural cultivation must be linked to the protection of ecological systems and sustainable development. In 2015, Viet Nam joined the Paris Agreement Accord with roughly 200 other countries to begin implementing national plans to cut greenhouse gas emissions. The ministry has set up an action programme to deal with climate change in the period of 2016-20, targeting reduction of greenhouse gas emissions by 20 per cent every ten years. For cultivation, the ministry has targeted effective rice cultivation in response to climate change and development of drought or saline-resistant plants. For animal husbandry, the ministry is planning a switch from the small-scale animal farms to bio-safety farms. For forestry, it will keep implementing the payment programmes for forest environmental services and boosting the management of irrigation systems and water use, he said. According to the Crop Prospects and Food Situation report released by the UN’s Food and Agriculture Organisation (FAO), Viet Nam is expected to be the world’s fifth largest rice producer in 2017, with an average yield of 28.2 million tonnes annually. The FAO forecast that the biggest rice producer this year will be China with 142.3 million tonnes, followed by India with 110.4 million tonnes, Indonesia and Bangladesh. Crop diversification is an effective measure to help agriculture become more climate resilient in Viet Nam and other Mekong countries, experts told the Viet Nam News on the sidelines of a conference on Thursday in Hoa Binh Province. The conference was designed to discuss with community and social organisations ways to facilitate climate resilience of agriculture and forestry in the Mekong Subregion. Vietnamese farmers, many of whom rely on a sole agro-product, are highly vulnerable to extreme weather events. “Producing a variety of crop and other agro-products in just one farm would help reduce both climate risk and the risk stemming from market fluctuation,” said Do Trong Hoan from the World Agroforestry Centre (ICRAF). Hoan said the solution was particularly suitable for mountainous regions where monoculture is often the tradition, citing an ICRAF project in the northwestern mountain region that helps farming households combine growing agricultural and forestry products. “Farmers can both grow grass as feed for animal husbandry, corn, timber and orchards,” he said, explaining that this would help them reap economic benefits and lessen the pressure on the environment due to deforestation and land degeneration. Promoting agricultural diversification and mixed farming systems is also an objective of an on-going project in Laos’ Saravan Province to adapt to climate change, said Hongnapha Phommabouth, a representative of the Vientiane-based Green Community Development Association (GCDA). Like other countries in the region, climate change has hit the land-locked Southeast Asian country in recent years with often-occurring drought and flood. The frequent drought resulted in low yields for farmers in the rural areas of Saravan Province who used to grow only rice. “The GCDA project has helped them shift from rice to bamboo, and in the upcoming second phase of the project, we will ask them to combine it with growing organic vegetables and raising fish,” Phommabouth said. Yadana, director of Myanmar’s Braveheart Foundation, said the Myanmar government was also introducing the crop diversification system to help farmers increase yields and incomes. Luu added that there is no single solution for all regions in response to climate change. Solutions differ depending on the natural and socio-economic conditions of each region. According to Luu, one of the major challenges was the lack of awareness by farmers and local authorities on climate change. In addition, rigid socio-economic targets set by higher authorities like district or provincial authorities, mostly focussed on quantity rather than long-lasting solutions, also discourage farmers and commune authorities from applying new climate-resilient methods.